A significant majority of artefacts found in Birmingham City University Art and Design Archives are authored by students, and most of them are representational and traditional in nature. Nevertheless, you can find some experimental artworks in the Archives, but they usually owe their vanguard nature to teachers. The first part of this guide focuses on the work of Marion Richardson (1892-1946), who was a well-recognised art teacher and pioneer of the child art movement. The Archives contain a whole range of documents connected to her career and personal life. The collection includes correspondence, diaries, photographs, press clippings, lecture notes and several hundreds of examples of children’s art as well as recent research on Marion Richardson. The second part of the guide consists of examples of students’ abstract exercises, all made in a similar style, presumably because they were taught by the same teacher, Bernard Philip Arnold (1893-1995). The last part of the guide pertains to the work of two previous School of Art lecturers, Eddie Price and Mike Steveni who were interested in systems and the role they could play in the production of art. Through an exploration of material traces we will ponder on their intriguing methods of making art, which could be described as generative art . If you think that the above painting was prepared by one of Wassily Kandinsky’s followers you will perhaps be surprised to hear that it was painted by a 9-year old at the Girls' High School in Dudley in 1928. Edith Southall, the author of the picture, was a pupil of Marion Richardson, a charismatic teacher who encouraged her students to use self-expression in art. The results were extraordinary for its time, as abstraction had only started to be considered as art. Richardson trained at the Birmingham College of Art and Design and then became a teacher at Dudley Girls High School . 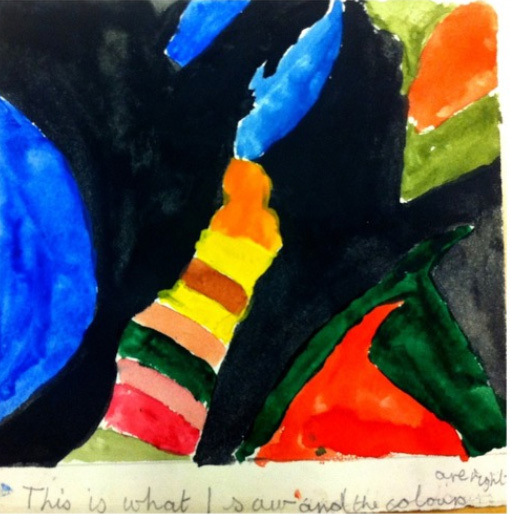 The Marion Richardson Archive contains several hundred examples of children’s paintings, many of which are entirely abstract, resembling lyrical abstraction. These pictures are the result of Richardson’s innovative method of teaching art, stimulating visual memory and independent, creative thinking. Her students were encouraged to close their eyes and to wait for any image to appear, once established they should paint what they ‘saw’ (Swift, p.2-3). The next step for students was to evaluate their own work which was then written under the picture. The inscription under the above picture says: ‘This is what I saw and the colours are right’. This painting is another example of children’s art painted under the eye of Marion Richardson. Created by a 14-year old Kathi Hyde it consists of simple, abstract forms. Visually it resembles Kazimir Malevich’s Black Square and interestingly it was painted in the same year. This painting was prepared by one of Bernard Philip Arnold’s students. Arnold taught industrial design and photography in the School of Art from 1930 until the early 1960s. He remained a visiting teacher in the School of Photography until 1970 when he was 77 years old. His influence is visible in several works by students kept in the Art and Design Archives. Almost all of them are abstract or semi-abstract. 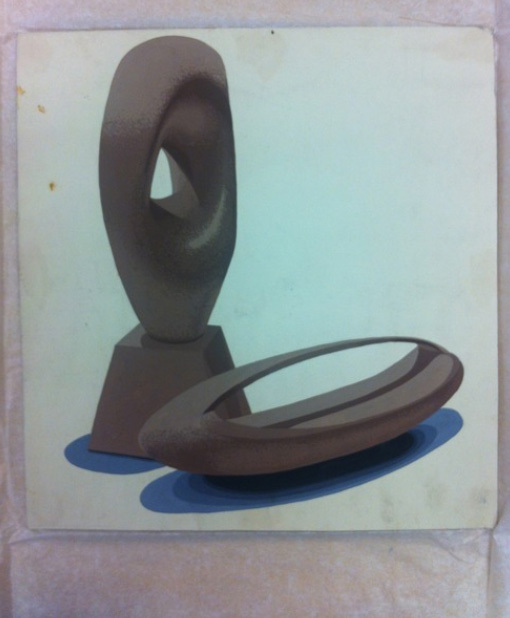 The above exercise resembles Barbara Hepworth’s sculptures or other examples of organic abstraction. This photograph documents examples of works made by Bernard Philip Arnold’s industrial design students. The label on the back explains that the designs are inspired by the geometry of natural growth. He encouraged his students to experiment with ‘Free Form’, which was meant to develop their ‘creative powers’. He was convinced that it was more important to encourage them to experiment in the first year of their studies than to engage with practical production. The forms produced can be either completely abstract or they may be based on natural architectural or engineering examples, deriving inspiration from, but not imitating them. This semi-abstract monochrome painting of industrial machinery is another example of an exercise designed by Bernard Philip Arnold for his students, to encourage the development of skills in perspective, composition and the use of tone. This time the focus is put on symmetry, ratio and proportion as opposed to experiments realising free imagination, as discussed above. Arnold called such exercises 'controlled experiments' with form. This image is one of the most interesting machine drawings by Mike Steveni, whose fascination with computers as well as experiments with software and system aesthetics represents 1950s and 1960s tendencies in art. 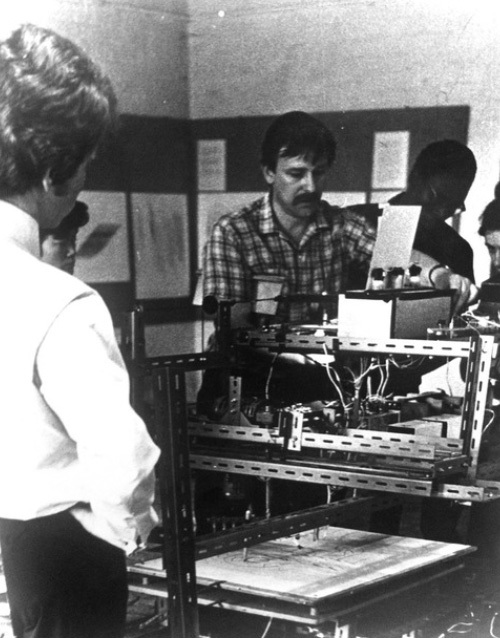 Artistic interest in the possibilities provided by computers and cybernetics reached a peak in the 1960s and the first large international exhibition of electronic, cybernetic, and computer art Cybernetic Serendipity was organised at the Institute of Contemporary Arts (ICA) in London, 1968. Within the School of Art Archive there are eight machine drawings by Steveni, all generated by a machine constructed by the artist himself. 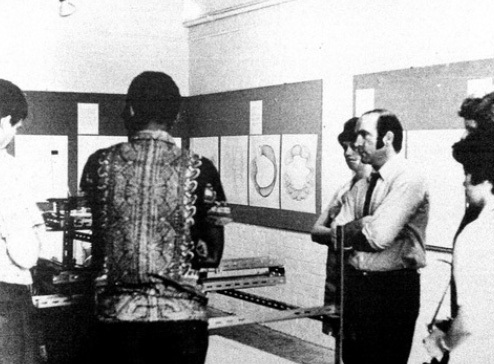 The drawings as well as the drawing machine were shown during the exhibition of computer drawings at Ikon Gallery, in Swallow Street circa 1969-70. Mike Steveni was a tutor at the School of Art Education based on Priory Road during the 1960s and early 1970s and was heavily involved in the theory of art education. He retired from teaching in 1986 and started a pottery gallery in Stratford-upon-Avon with his wife Dinah. He died in 2000. The above photographs document the exhibition of computer drawings at Ikon Gallery, in Swallow Street circa 1969-70. In one of the above photographs we can see Mike Steveni engaged with one of the drawing machines he constructed. Unfortunately, Steveni did not gain much recognition for his work as an artist, but the originality and independency of his experiments should not be passed over, perhaps they hold particular relevance now with modern developments in technology and its use within the field of creative practice. It may appear that his work solely appropriated what he saw elsewhere but it is also possible that his drawings and drawing machines resulted from pure invention and could be considered as the first examples of generative art experiments. Steveni's drawings resemble works by another artist linked with generative art, Desmond Paul Henry a Manchester University lecturer who constructed three drawing machines from modified World War II bombsight analogue computers. The photographs show diagrams and charts that form part of a conceptual ‘Systems art project’ developed by Eddie Price, who taught at the School of Art during the 1960s and early 1970s. Price was also interested in generative art. He created a system by writing the set of instructions and diagrams, which lead to creating actual drawings. The ‘Systems art project’ involved collecting data on the colour of clothing worn by students from a group he taught over a period of ten weeks. The lower image is a fragment of ‘The Main Code’. The artist prepared a grid of 100 squares in ten rows of ten, each containing letters symbolising the colours of clothing worn by 10 members of a group of students over 10 weeks. 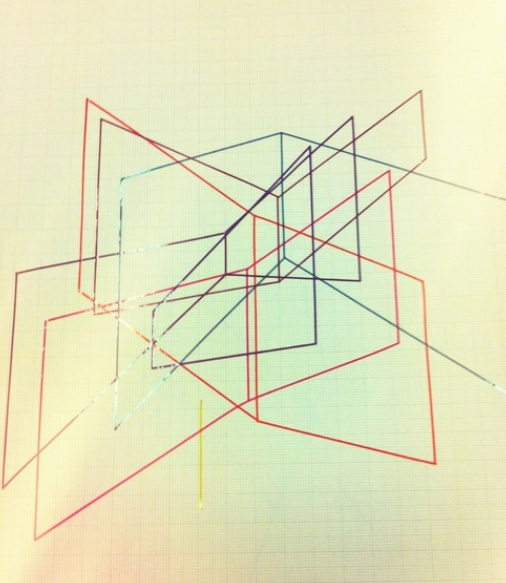 The final stage was the production of a geometrical pattern based on the code. 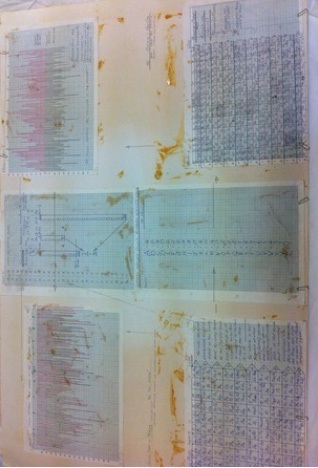 The drawing is the final stage of Price’s experiments. The geometrical pattern is based on the code, in this case a random selection from it. It seems like the rules are open enough to produce many different results. 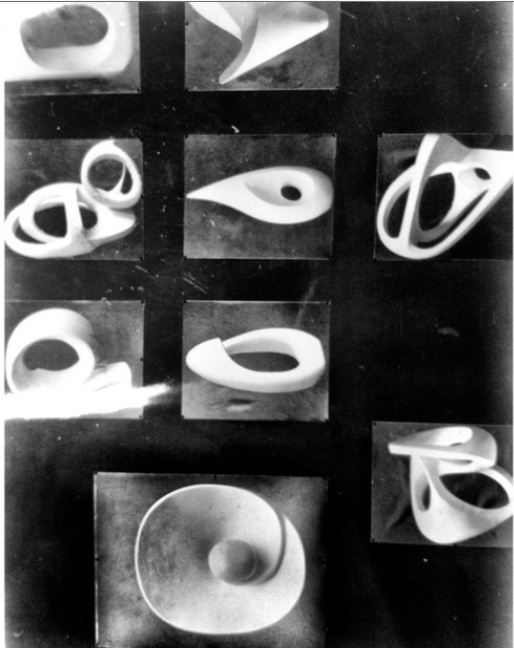 Similar chance-based and procedural techniques were used by other artists of the 20th century including early experiments by Dadaists like Hans Arp, and later by John Cage, Allan Kaprow, Yoko Ono and Sol LeWitt. In a departure from physically making drawings LeWitt instead wrote a set of instructions, diagrams and rules (visually similar to the ones prepared by Price) which theoretically can be used by anyone, to produce drawings (Reas, McWilliams, p.21). LeWitt treated the execution of rules as secondary, and the rules itself ie. the idea, as the actual art. See a clip showing the production of Sol LeWitt's Wall Drawing #260 from 1975 at The Museum of Modern Art, 2008. This website shows how you can do it (almost) yourself. 1. The term generative when spoken in relation to artistic practice describes art that has been produced using a system; whether it is a computer or any other non-human mathematical, mechanical or randomised autonomous process. 2. She later worked at the London Day Training College and as an Inspector of Art to London County Council. 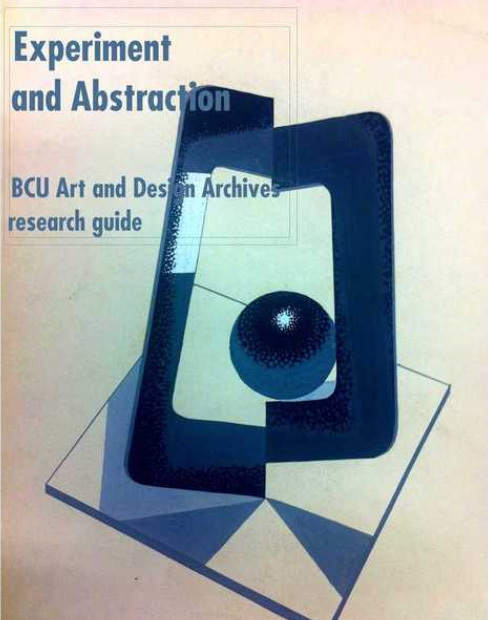 This guide provides an introduction to the Birmingham City University Art and Design Archives collections highlighting the number of sources waiting to be discovered and used in art and curatorial practices, as well as placing artworks in a wider artistic and historical context. The guide aims to encourage students to discover more. It may also be treated as an example of a curatorial investigation leading to the formulation of topics for potential exhibition. Experiment and Abstraction is a guide, which presents findings from a three-month research period in the archives undertaken by Roma Piotrowska, a Contemporary Curatorial Practice student. This project took place in 2012 as part of the Student Academic Partner scheme. During this period Roma browsed through a section of eleven different archives and collections within the Archive, looking for interesting topics, which she could potentially use to curate an exhibition. Her research has been narrowed down to artworks made between the beginning of the 20th century and the 1980s. Finally she has distinguished a theme Experiment and Abstraction that is repeatedly visible in some of the collections, particularly BIAD School of Art Archive and Marion Richardson Archive.